"A passionate call-to-action, an inspiring vision, and a practical guide…three seasoned education leaders in the 'establishment' lay out a compelling case for systemic changes to enable personalized education." "Creating school environments where students are 'leading their own learning' is a powerful focus of Personalizing 21st Century Education. This compelling yet practical book provides readers with the foundation and motivation to move personalized learning to the top of the agenda!" 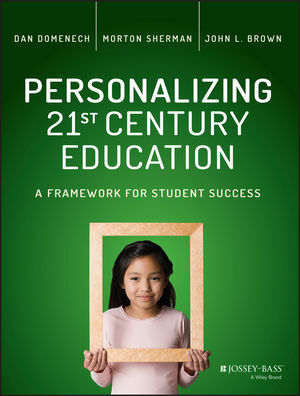 "Personalizing 21st Century Education highlights the need to move from differentiation to personalization in today's classrooms. Equitable opportunities to learn can be realized if we have the courage to dramatically reimagine teaching, assessment, and accountability. This book is a call to action for the dramatic paradigm shift we need in order to serve all learners well." DAN DOMENECH, PHD, is Executive Director of AASA, The School Superintendents Association. MORTON SHERMAN, EDD, is Associate Executive Director of AASA. JOHN L. BROWN, PHD, is Executive Director of Curriculum Design and Instructional Services for the Alexandria, Virginia, Public Schools.